The name change and rebrand was both a practical and tactical decision. We were established as Sonas apc to deliver training in the Sonas Programme, an evidence-based therapeutic activity developed by our founder Mary Threadgold RSC. Since then, we have broadened our work, pioneering new initiatives and delivering a wide range of innovative dementia training and resources. In 2015 we were awarded a GSK Award in recognition of our contribution to improving the quality of life of people with dementia in Ireland. While the original name holds significance, we are excited about the transition to Engaging Dementia as it better reflects the work we do today and into the future. 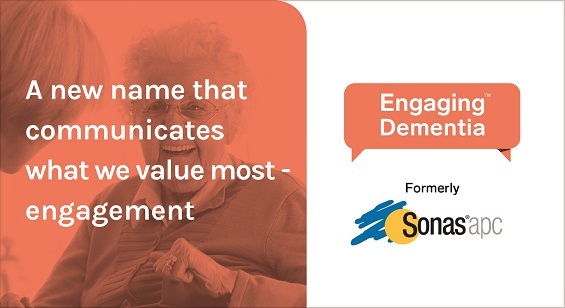 Engaging Dementia communicates what we value most – engagement – which is at the heart of what we do. The distinctive logo features a 2-way speech bubble symbolic of our passion and mission to maintain our focus on communication and innovation, supporting the 55k people in Ireland currently living with dementia. The new logo was created by McCann Creative Communications, Dublin. The Sonas Programme will retain its name and we will continue to serve the 450 Sonas Programme Licensed Practioners (SPLPs) in over 280 nursing homes in Ireland to maintain high standards in their delivery of the programme.